If you love "The Twilight Zone" and actions figures as much as we do, take note! An announcement has just been released that Bif Bang Pow! joined a "...creative partnership with ZICA Toys in conjunction with David Lee, makers of high-quality retro-style toys and action figures, to produce a line of "The Twilight Zone" 3 3/4-inch retro action figures scheduled to ship in the Fall of 2014." They've released others before but at 3 3/4-inches, they're the size of modern figures. Which iconic characters from "The Twilight Zone" series will they be including? The release gives the run-down of the figures that include the following: "William Shatner's nervous airline passenger Bob Wilson and the Gremlin that wants him to crash, both from the terrifying episode 'Nightmare at 20,000 Feet;' the sly alien Kanamit from 'To Serve Man;' the Invader from Agnes Moorehead's 'The Invaders' episode; Burgess Meredith's avid reader Henry Bemis from 'Time Enough at Last;' and Talky Tina, the doll that spells doom for Telly Savalas in the 'Living Doll' episode." The release also adds that the figures will be produced in classic black-and-white, matching Bif Bang Pow! 's popular 8-inch line of Twilight Zone figures, accompanied by an extremely limited edition color series. 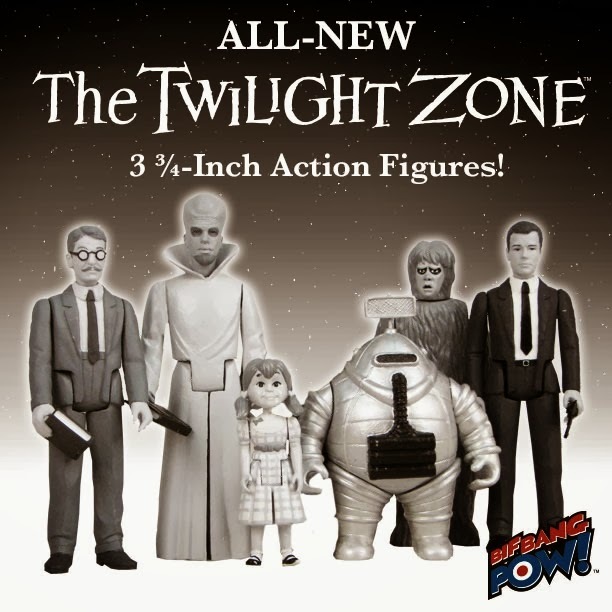 "We're excited for our Twilight Zone action figures to be the first Bif Bang Pow! property to 'enter another dimension' in 3 3/4-inch scale," said Jason Labowitz, President of Bif Bang Pow!. "It's been great to work with a notable company like ZICA Toys to create these action figures for avid fans and collectors of the celebrated TV series." The Twilight Zone 3 3/4-inch action figures are now available for pre-order at Entertainment Earth.